-Tony Gonzalez played his final game. Automatic Hall of Famer. Gonzalez had 8 of the top 30 seasons worth of EPA for any TEs in the database, which goes back to 1999. In his final year, he led all TEs in both WPA and EPA. -Cam Newton led his team to a 1st round bye. He is a very good QB, but gets far too much credit for a team with one of the best defenses and a solid running game. He squeaked by a beat-up Falcon team by a point with just 4.0 EPA and 0.09 WPA for the game, but I keep seeing him lauded by pundits all over tv. -CAR's win means NO won't be in the dome but will be on the road in PHI for their first playoff game. Should be a fun one. -CIN's defense is very strong, even without its best player. When Geno Atkins went down injured, I thought they'd lost their lynchpin. Apparently not. The efficiency model has been very high on CIN all year, much higher than the pundits. In my book, the second best team in the AFC behind DEN. -IND doesn't seem to scare anyone without Reggie Wayne. -How about a little consideration for Gus Bradley for Coach of the Year? He took that roster to 4-3 after the Jag's bye. -The DET-MIN game was the only one that didn't either involve the playoffs or the 1st overall pick. Both teams sat their best player. -HOU was up early against TEN, and WAS had no chance against NYG. It looked like HOU may be on their way to blowing the 1st pick, but salvaged the loss. It goes to show that losing a single game is too painful in the NFL to take a dive. -By the end of the game, ARI and SF had little to fight for, but kept going hard. Anquan Boldin may have made the difference for BAL this year. He led the league in both WPA and EPA both by a large margin among all WRs this season. Amazing football player and heavily underrated. -Aaron Rodgers totaled +1.20 WPA in his return game. That's a lot, in case you're wondering. It basically means he won the game single-handedly, two and half times over. Rogers averaged +0.15 WPA per game over the past 8 games, and he didn't play in 7 of them. +0.15 WPA/G alone would put him 12th in the league. -The big question in the GB game was McCarthy's decision to kick the XP down by 2 with about 11 min to play. The WP model says it was right at the break-even point, needing a 47% chance of success to be worth it. That's right at the league average. But with the CHI run defense and Eddie Lacy running well, the decision probably breaks toward going for the 2-point conversion. My own instincts tell me the model may not have the precision needed for the decision. The distinction between being down by 1 and down by 2 at that point in the game requires CHI to score 2 FGs and then GB scoring a TD to make the difference. It's such an improbable scenario, I can't believe it's worth that possibility to pass up the opportunity to tie the game. -Even at 8-8 I think BAL over-performed their talent. I have to give the coaches and team a lot of credit. But BAL's offense is just plain awful. They're historically bad in the running game and their deep passing game didn't pay off like it has in years' past. The efficiency model (and a lot of other metrics) were very down on BAL all year. Even when they held position for the wildcard, the model thought it was MIA's to lose. -And it was MIA's to lose, and sure enough, they did lose it. An hour into their game today, they had an 80% chance of getting a playoff berth. Then the bottom fell out. A half our later, it was at just above 30%. And it just dropped from there. Heartbreaking day for MIA fans. -SD's game was truly epic. The big decision was the 4th and 2 from SD's own 28. The fake punt was a questionable call. I would have punted. Here's how it breaks down. A success keeps the game in the '1st possession' state and gives SD a 0.56 WP. A failure gives the ball to KC in sudden death with a .83 WP (which is 0.17 for SD). Punting gives KC the ball at their own 32 in sudden death, worth 0.42 WP for SD. The math works out so that the break even success probability is 64% for the fake. That's pretty risky. The league average conversion for 2 yards to go for conventional scrimmage plays is under 60%. Risky call, but it worked out for the Chargers. -PIT fans were on quite a roller coaster all day. They've got plenty to gripe about. If they had pulled of the playoff berth, it would have been just short of a miracle. -DEN and SEA took care of business as expected. With Peyton Manning breaking records left and right this year, I get pelted with questions about things like, who was the last QB to score so and so many TDs in such and such a season...? This isn't Advanced NFL Trivia. That's not what I do. 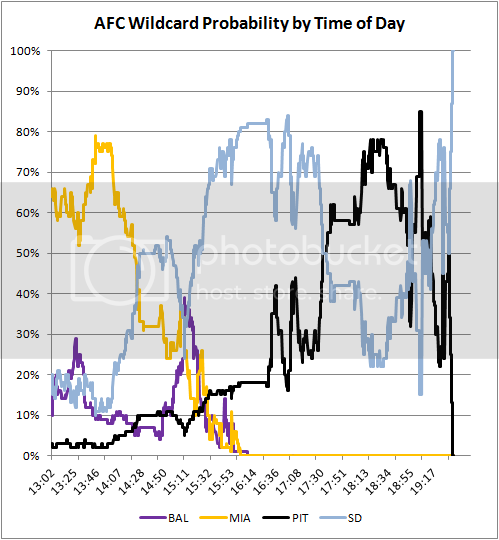 -The playoff probability widget worked great all day. Thanks to everyone for passing the word. It made for an especially fun companion for watching Red Zone. I was worried MIA would run away with the win and nobody would care. Turns out that wasn't an issue. Unfortunately, the data feed froze with 2 min to play in the SD-KC game, but oh well. At that point, we didn't need numbers to tell us what was going on. "Anquan Boldin may have made the difference for BAL this year". Though true, I think you meant SF. As a Steeler fan I can really appreciate your graphic. It shows the only 90 minute stretch of the season (30 minutes game time) where it was plausible that I be optimistic about the postseason. Anonymous, I think he meant Baltimore, as they were the ones that missed the playoffs. On a related note: I'm new here, so I don't know if this is your area of expertise, but don't the Ravens have a history of overperforming? It just seems like, under Harbaugh, they've always had one of the best records in the league in one-score games. At what point does it become a pattern? First Anonymous, in response to your post, I think even if McCarthy was planning for that scenario it still makes sense to go for two on the first TD. Think about it: if they go for the XP and Chicago scores a TD, then GB is forced to score a TD and then have to go for two to tie. And if they fail, the game is over. Versus if they go for two the first time around and fail, now they have the knowledge with a couple minutes left that they may have to produce a TD and a FG to win the game, and can start to game plan appropriately. If you have to go for two either way, why not go for two early instead of putting yourself in a position where your entire season comes down to a single 2-pt conversion at the end of the game? Fourth Anonymous, I agree about having the knowledge of what you need being of value, and there does not seem to be a way to quantify that to make it part of the model. Chicago would have been up TWO after a failed two-point conversion by the Packers. The Bears had shredded the Packers for three straight TDs so another TD and a PAT at that point means a NINE point lead. That is two scores to win. It becomes a pattern as soon as it happens. When does it become something reliable you can predict going forward? Once you can prove WHY Baltimore keeps winning, and that Baltimore isn't simply the lucky outlier. With 32 teams and 256 games you'd expect a few extreme results here and there from randomness alone. JJ, it seems like on the most technical level the decision comes down to which has a higher probability: the Packers getting a two point conversion, stopping the Bears offense on the ensuing drive, and then going back and scoring a FG or TD to win it (or win in overtime), or the Packers going for the XP, and then scoring a TD + the 2 pt conversion after the Bears score a TD + XP (you also have to factor in the time of play the Packers would have to score the winning TD in both scenarios. Obviously you'd assume in scenario 2 the Bears would have tried to run out the clock before they scored versus in scenario 1 the Packers would've gotten the ball back with several minutes left). It just seems to me intuitively that the Packers would have a higher probability of winning the game with scenario 1, even given the fact that the Bears had scored TD's on the previous 3 possessions. JJ, if the Bears come back and score a TD, GB will need a successful 2 point conversion to avoid needing 2 scores to win. It makes little difference if that attempt happens with 11 minutes to go or 2 minutes to go. But if the team's just trade field goals or go scoreless, that XP is the difference between OT and the end of the Packers season. The only time the XP helps is the original scenario. Bears FG to go up 4. Packers come back with a TD to go up 3. Now a Bears FG only ties, not wins. But even in that scenario, the Packers can make it right by converting the second 2 point conversion if they miss the first one. The double fail is only a 28% probability. The Advanced NFL Stats podcast recently hosted Professor Harold Sackrowitz who wrote a paper on the topic (paper is linked form this page): http://www.advancednflstats.com/2013/12/podcast-episode-13-harold-sackrowitz.html. He used dynamic programming to calculate the optimal strategy based on the score differential, the number of possessions remaining in the game, the probability of conversion success, and the probability of a drive resulting in a TD, Field Goal or nothing. His conclusion was that going for 2 when down by 2 is the right choice when there are less than 16 possessions left in the game with pretty conservative assumptions on the probability of conversion success. The paper is well written and worth reading. Yeah, an 8-point game isn't really a one possession game. It's more like a 1.5 possession game because you don't know if one TD is going to be enough or not. The thing is, though, that Lacy in fact was not running well. Look at his previous carries, he got a 6 yard TD right there, but it was a busted play. He had run for 1, 0, 2, 1 zero or something like that. If Green Bay's 2-point decision was supposedly close to 50-50, I wonder if that is just because of the familiar phenomenon of teams who are behind being forced to play more aggressively. That seems to be the explanation for most of the head-scratchers that result from the WPA model. Brian, you need to rethink the accuracy of your model. I presume you used the probablity that being up 2 with 11 min left, you are winning 64% of the time. But what is the error estimate of the probability? If it's as large as +- 2%, that will have a huge effect on the break-even probability for the 2-point conversion. Plus the uncertainty of the winning probability of being 1 up, and tied. In the last 8 games between the Bears and the Packers, there have been only 27 penalties committed against Green Bay to 57 against Chicago. In two years (four games) the Bears committed less penalties at the end of the year. In any one game this entire year Green Bay has committed at least two penalties, but in games against Chicago they had only one penalty in two total games against the Bears this year. Now, I'm not sure if penalties are usually higher in divisional rival games or not, but can someone tell me what the odds are for one team to have their two perfect games against the same team and then the odds of that team having less penalties in each 8 games?